During my childhood, every so often my father had to travel for work purposes. He would usually come back with a new game for me to open and play. Sometimes, I asked for a particular title. On this occasion, he had business in Denmark and I inquired about the possibility of obtaining Advanced Civilization. He brought back Sixth Fleet. I didn’t care, that cover was just fantastic! The Fleet series (as it’s commonly known in the wargaming community) from Victory Games is a set of five game titles on modern naval warfare, released from the mid nineteen eighties to the start of the nineties. Their names are based on the eponymous United States Navy fleets. The USN has split up their naval commands into fleets that cover and are responsible for different potential theaters of war. The five fleets the game series represents are: 2nd Fleet (North Atlantic and the Arctic), 3rd Fleet (Alaska, North Pacific, Caribbean, North Sea, Bay of Biscay), 5th Fleet (Indian Ocean), 7th Fleet (Western Pacific, South China Sea, Sea of Japan) and 6th Fleet (Mediterranean and Black Seas). Our post today will focus on the last one. This game is about late 20th century (circa mid-80s to early 90’s) naval operations within the background of the Cold War. The scale is 50 nautical miles per hex, 8 hours per game turn and depicts individual naval ships, submarines, patrol boat squadrons and aircraft squadrons/groups. 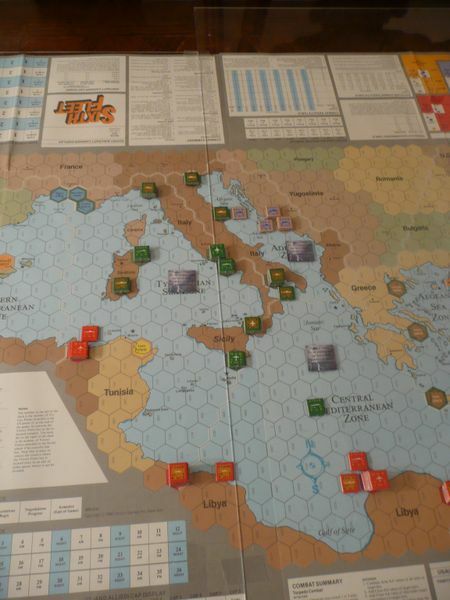 The game map comes in two pieces which depicts the entire Mediterranean basin plus force displays and numerous other charts and tracks required during play. The playing area is split into various sea zones, which is important for strategic air missions (because they are flown in specific sea zones). Pulled from BGG! Some zones are visible here: Central Med, Aegean, Adriatic, Tyrrhenian, etc. You play one of many scenarios (classified as Introductory, Intermediate and Advanced) and they have different objectives depending on the complexity of the scenario. The easiest ones will usually be straightforward shooters where the point is to eliminate the other side’s forces but some may require escorting convoys (in modern game parlance “pick up and deliver”) or hitting specific enemy bases and causing a target amount of damage. The Advanced game introduces geographical objectives and depending on which scenario you play some of them will be more valuable than others. You will be using amphibious assault ships to disembark troops or aircraft to fly in paratroopers to control these objectives in addition to standard scoring for eliminating enemy forces. The game is operational with some tactical sprinkling added in, but otherwise you’re nominally the Admiral in charge for the entire theater, so you have to think BIG picture! You will conduct strategic air reconnaissance, assign combat air patrols (CAP) over your bases & carriers, direct air strikes against enemy targets and you’ll assemble task forces and sail them into harms way to fight your opponent. Some of these activities might seem to correspond to lower level officers (CAP for example). This just means there are more hats to wear since you’ll be deciding which targets to engage and how each specific game unit moves around the map. Although with the amount of information available to modern commanders, who’s to say they wouldn’t be directing orders at submarine or destroyer captains to fire at specific enemy ships and bases? Your basic game pieces are air squadrons, surface ships and submarines. Note that a few ship counters represent small squadrons of patrol boats. They all have wonderful silhouettes, color coded for which side they’re on and provided a bounty of game ratings. Air squadrons have air range, bombing, air to surface, air to air and anti-submarine warfare (ASW) values. They also have a unit type since some aircraft are limited in what missions they can fly while others (Airborne Early Warning and Control plus Electronic Warfare) have extra abilities. Some will have an icon depicting whether they are ALL weather aircraft or if adverse weather can ground them. They’re named for the type of aircraft they fly. So squadrons are NOT mixed in this game. One counter, one squadron of a single aircraft type. USS Nimitz was relatively new in the time frame of Sixth Fleet, only 3 of her class were commissioned at the time. Surface ships are individually rated for movement, surface to surface combat, defense, close anti air-rating (machine guns), gunnery (if they have a gun), area anti-air (missiles) and ASW values. Helicopters are in this game but they are abstracted into their naval ship, reflected primarily in their ASW values. Submarines are rated very similarly to ships except they will have NO anti-air values whatsoever but will have a torpedo rating. Aside from a short name (due to counter space, a lot of ship names are abbreviated), they also have a general type (PC, DD, FF, SS, SN, CG, CV, etc) with two letter codes that generally correspond to US Navy practice. The game plays as a series of turns, each representing 8 hours of real time. Naturally this leads to some obvious implications. Every three game turns is one day. There is an AM turn, a PM turn and a night turn. This is relevant in that not necessarily all aircraft can perform at night, some air missions are committed in the morning lasting the entire day (air reconnaissance, tactical coordination, etc.) and other game functions (task force formation, satellite detection, etc.) impact the entire 24 hour cycle so you take care of them whenever the sun rises. This means some extra activities are done in the morning turn and then clean up is performed at the end of the night turn. USS Ticonderoga. Brand-spanking new in ’83, decommissioned in 2004. How time flies. The first AEGIS Cruisers were the backbone of the fleet’s air and missile defense. You can’t pick the same type of units twice in the same turn. Once you activate all your subs for a turn, you can’t choose to activate them again in the same 8 hour game turn in a subsequent action segment. In practice this means all of your units will get to act once during a game turn (unless you choose not to), what changes is the order in which these units will move and fight. This is very much the heart of the game which you have to plan and orchestrate your moves and attacks so the surface ships, air squadrons and submarines support each other to accomplish your objectives. As an example you might want your submarines to go first, scout ahead and take out some threats against your ships before moving the convoys. Or maybe activate your air units first to soften some targets before the subs go in for the kill. Activate surface task forces and get those carriers in range for an air strike. Your brainpower will be spent here figuring out the right moves for the current map situation and thinking ahead like chess on where your units will be 2-3 turns from now. One could consider this to be a blend of tactical and operational game mechanics because while you’re not choosing flight formations, nor dictating specific ship tactics, you ARE trying to coordinate the actions of different unit types. You need to decide whether to attack with missiles or torpedoes. What about naval guns? The order in which you put ships in a stack has direct impact on air defense. You dictate which aircraft act as strike aircraft and which are escorts during an air mission. It’s an intricate puzzle you have to solve to win the game and there are lots of choices to be made. While no game will be a perfect simulation (and this one has its quirks like every other game), I find the abstractions work well enough to provide a good representation of what naval warfare in the 80’s would have panned out in practice. The rule book is littered with design notes about what different game mechanics are trying to represent. After the action phases are completed, you wind down activity this turn by landing CAP. If it’s the night turn, you do the clean up for the activities started in the morning (the air missions and detection). Moving and attacking is just part what makes this game tick. Arguably the most important part is DETECTION. The game is not double-blind, so you don’t physically hide your units from the map. All units are present at all times. The game design justifies this in that many intelligence sources from HUMINT to satellite reconnaissance will give you the general location of enemy units continuously, but in order to actually attack the enemy you have to pinpoint their exact spot through the game’s detection mechanics (after all, a 50 nautical mile hex is rather roomy in real life). Whenever conditions are met for detection on an enemy unit you get to place a detection marker on it . There are various ways a unit can get such a marker. During a whole day, each side will reap the benefits of spy satellites which will allow them to place one to three (the exact number determined randomly via die roll) such markers on any unit on the map they want to. Strategic air missions can generate such markers as well for a unit int he zone they are employed in. Your naval task forces and submarines can also generate them if they are close enough to enemy ships, though submarines are harder to detect in this fashion and you practically have to be on top of them to do so. The Soviet Minsk. An aircraft carrier but nowhere near as capable as a USN one. Still armed to the teeth so not a sitting duck either. Ships and subs have a detection zone (similar in concept to a zone of control in many hex and counter wargames). The basic zone corresponds to the six hexes surrounding the unit or task force, plus the hex they occupy. The bigger task forces and more technologically advanced submarines will have an expanded zone two hexes away from their location (a second outer detection ring). During the action phase units may be detected if moving through enemy detection zones. Also, the simple act of FIRING a weapon will generally cause everyone to pinpoint your location no matter where you are. These markers last throughout the day and may be removed at the end of the night turn assuming prying eyes aren’t shadowing them (like being within the detection zone of enemy ships and subs). Air units are unique in that they’re always detected while on the ground but do require a different kind of detection mechanic in order to be intercepted and attacked by opposing air units on CAP. This game has a multi-purpose combat results table that is fairly intricate but not over-bearing. The vast majority of the different types of weapon’s fire is resolved on this table whether that be bombing, missile (SSM) combat, torpedo, gunnery or ASW. Most combats will have two rolls, one for the attacker and one for the defender (some like ASW don’t have a defender die roll). The Defender can have a positive DRM when surface units are defending as part of a task force. The attacker has a wide range of results because the Defender’s combat RESULT is subtracted as a DRM from the Attacker’s roll as a negative DRM. The Attacker can also have positive DRMs. For example tactical coordination (a strategic air mission) can be used to increase your chances of hitting the enemy though up to a point (maximum of +3). Once you determine your net DRM you roll and get the attacker’s result. To determine the results you add up the total combat value for that type of combat (bombing, missile, torpedo, etc.) And you find the column corresponding to your total. That’s the column you use to roll the die and cross reference. Notice however that the possible range of die results depends on whether you’re the attack or the defender, so cross reference correctly. Why yes, factor optimizing is alive and well when your sub has 22 factors of Torpedoes and can fire at two targets, that leftover factor can be used to sink the Captain’s Yacht! In order to hit a ship or submarine you have to achieve at least half as many hits as their defense rating. You can sink a unit outright by scoring at least as many hits as its defense. The usual six sided die is used to resolve the fate of your ships (though in later games this was changed to a ten sided die). A more old school CRT. Air to air combat is the only outlier which has a separate table and is a much more traditional CRT with combat ratios like 1-1, 2-1, and the like. One added wrinkle is that the row chosen for the ratios depends on whether combat is occurring during a specific segment of the the strategic air phase (Interception of those once-a-day air missions) or anything else (Combat Air Patrol for example). Losses are also traditional since they are expressed as step losses. If an “r” accompanies the result the enemy aircraft abort and return to base. Units have just two sides (even air), full strength and damaged, which is fairly justifiable in that ships in this era, with few exceptions, are tin cans with hammers. There’s very little granularity in combat between a fully functional warship, damaged and sunk. Ask the Royal Navy about the Falklands. Turbulence. I don’t like that. As you increase the difficulty, the game introduces more random elements to throw at you. Weather is one of them, for which roll a die on the table and the different sea zones might suffer a squall and in some cases a storm, interfering with detection, reducing movement, impacting attacks and even grounding aircraft for that turn. Another one is command and control. 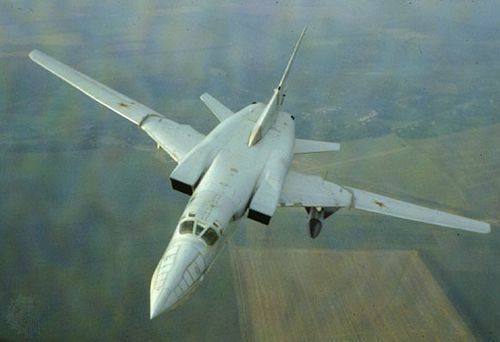 Soviet Naval Aviation’s primary bomber. While the US and the Soviets are the main adversaries they also have allies. This is differentiated in the counter colors. The US Navy is solid dark green while the Soviets are solid red. NATO Allies have the same green as a border with a different background color while Soviet Allies have the same red as a border with their own background colors. Some navies aren’t associated with either side and have a tan border (Countries like Israel, Egypt, Spain, Tunisia, etc). That doesn’t mean they are neutral, they aren’t part of an official alliance structure but the scenarios will put them in the proper camp. If you suffer command and control failures in certain sea zones, then allied forces will be limited in how they can attack or defend together. You have 10 minutes worth of fuel, we stay here 10 more minutes! This is a MODERN naval warfare game, so unlike World War I and World War II you’re going to get ships with different propulsion systems. Because of the time scales involved and the nature of said warfare, ammunition can be expended mighty quickly. In a basic game you don’t worry about it, but in the Advanced game it’s an optional rule. While the vast majority of the ships in the game use conventionally powered engines, you will have a fair number of them using nuclear power. Primarily this will be in the advanced attack submarines available to the USN and the Soviet Navy, but also the US carriers and other major capital ships. This really changes the game significantly because you have to worry about both fuel and ammunition. Suddenly those ammunition supply ships become quite valuable! You will have log sheets that record the logistics of all bases and ships. Air units will use the supplies from whatever base (or carrier) they are flying from. When you engage in combat you will have to start crossing off boxes from the appropriate weapon type (SSM, AAM, Torpedoes, etc.) in order to use your combat value. You can even choose to cross an additional box to intensify your attack and add 50% more attack value but you end up emptying those magazines fairly quickly. In practice, the primary impact will be on the smallest frigates and patrol craft because they have low capacity. Meanwhile US Navy carriers have enough ordnance for their aircraft to sustain operations for quite a few days before running out. There are procedures for transferring ordnance from bases in ports or ammunition ships to naval units. Some cargo vessels can replenish supplies for bases once they dock. Thus, everything you write is scribbled in pencil. Have an eraser handy! For fuel you have a similar situation where a fuel box can last a full day of operations. The game gives you two options for tracking fuel, a simple one, and a more detailed one. The simple one just crosses off one box for all non-nuclear naval combat units, regardless of how they move during a turn. This method assumes naval units are constantly on the move even in their own hex. The slightly more complex method allows you to conserve fuel by not moving or moving just a single hex per turn. In that case you don’t mark the box. As soon as a unit moves at least two hexes in any turn of the day you put in a hash mark to remind you to cross off the box at the end of the night turn. The game provides tanker units as well to help re-supply and move fuel to advanced bases and ships. While book-keeping can be a drag I can’t endorse enough using this option because it increases the simulation value of the game tremendously (or the hassle depending on your point of view). The previously mentioned nuclear propulsion ships don’t worry about fuel. This business will get out of control, it will get out of control and we’ll be lucky to live through it! I would recommend playing in the order of the scenarios since they build up in units and complexity. Starting with just several ships and low rules overhead. The introductory scenarios generally focus on one or two category of units allowing you to handle primarily air, surface or sub units and learning specific mechanics and combat procedures. They also tend to focus on small parts of the map. The intermediate scenarios start mixing it up a bit by giving you a larger forces and introducing more advanced rules like mine-laying, mine-sweeping, weather, command and control. When you finally reach the advanced scenarios you will have even more rules to add in because finally you will have to manage reinforcements, disembarking amphibious assault ships, flying in paratroopers and battles will now revolve around specific geographical objectives and for the soviets, victory points for sea denial. Not that you will be rolling for combat between troops and tanks. Ground forces are abstracted into points in this game. At the scale of 8 hours per turn whoever has more than twice as many ground points as the other side will control an objective (there are smaller multipliers for having more points than the other side but not a super-majority of points). The Advanced scenarios provide background on what’s going on, from a border incursion to World War III. These scenarios all have a high level of replay-ability because the nations that get involved and at what level in each scenario are rolled for and determined randomly. Of course there are modifiers for each nation which change depending on the scenario and some guarantee involvement. For a example, a war involving the middle east gives Israel a modifier so high that OF COURSE they will be in it. Similarly for the UK the invasion of Western Europe gives them a high enough modifier that their involvement is a dead certainty. However, these rolls may not fully activate a nation to your side, but instead may give you permission to use the bases you have set up in their country (as the US or the Soviets). As the game progresses random events may cause more nations to join or an escalation where a nation ups its involvement and activates its navy. The other factor that increases replay-ability is the preparedness level. You can set it to low, medium or high and this represents just how fast tension went up prior to the crisis blowing up into a shooting war. A preparedness level of high means that it was a slow burn which gave time for all nations to commit a larger number of vessels and air units into the area. A low level means everyone was caught by surprise and you will be fighting with a relatively low number of units while reinforcements are activated or trickle in from the Black Sea and the Atlantic. The value of the geographical objectives are different for each advanced scenario as they focus on specific crisis points in the Mediterranean. Finally, you can determine your game length as short, medium or long. While the introductory and intermediate scenarios have a set turn length, the advanced game scenarios do not and instead have an armistice track where the game can end depending on the die roll during the political phase. Length of the game has a DRM that impacts this roll. There are many optional rules that aren’t part of the regular game, like the use of nuclear weapons. The game has a list of units that can have such ordnance as part of their arsenal and there are special rules governing first use of nuclear weapons and the ensuing political fallout. The Alfa-Class submarine introduced by the Soviets in the early ’80s. It was state of the art back then. Generally speaking the consequences can be bad as your allies may decide to call it quits and abandon the field of battle while the enemy can recruit new partners into the fray. The practical benefit of nuclear weapons is that they intensify your regular attacks by a lot allowing you to heavily damage or even completely annihilate an enemy stack or base, but the cost in VP is considerable and you don’t want to use this option unless you’re likely about to lose the game. Other optional rules include using an advanced US destroyer (well advanced for the time period depicted in the game, the USS Arleigh Burke), Cruise missiles, An alternate US Carrier wing (that adds a second A-6 Intruder squadron at the cost of an A-7/F-18 squadron), soviet mine-laying submarines and more. I hope this comprehensive overview of Sixth Fleet gives you an idea of how the game plays, it is quite fondly remembered by its fans and very much played actively by the community. The value of this out of print title can vary wildly in the marketplace. While ebay offerings can be expensive (though mostly for the other fleet games) sometimes you can score a good game copy relatively cheaply. You just need to conduct a thorough search. One ping only. Its legacy has been extended by a Japanese designer and company that issued a modern 21st century title called Asian Fleet in 2007. Since then other titles have followed (though not always by the same company) and has been dubbed “The Japanese Fleet Series”. Availability of these is somewhat hard to come by unless you purchase directly from Japan. Recently Compass Games announced an intention to reprint the original fleet series games. I’m not sure if that means reprinting the 80’s version preserving the Cold War background, consolidating the various game rules (each title seemed to change something by adding or modifying an existing game mechanic or adding more optional rules) or if it means updating the order of battle to reflect the 21st century fleets. Personally I’d love it if we could have various time periods built in, and fight a hot war in the 50s or pick some other timeline all the way up to the present. Here’s hoping the popular modern air/naval warfare game system makes a comeback! Next Next post: March 2019 Monthly Update from GMT Games – Proselyting in Ireland and Insurrection Suppression in Gaul! Re: The Compass Games editions (if they indeed come), I have a feeling that they will probably be 1980s/90s like the originals. Compass already has South China Sea and the forthcoming Indian Ocean Region covering modern 21st century naval warfare. I presume that they will continue that series for other areas, as long as it sells. And there’s also Blue Water Navy, which is apparently full-on Cold War type stuff from the mid-80’s (eagerly awaiting that, honestly). But I agree with you that tons of scenarios from the 50’s till today would be great.